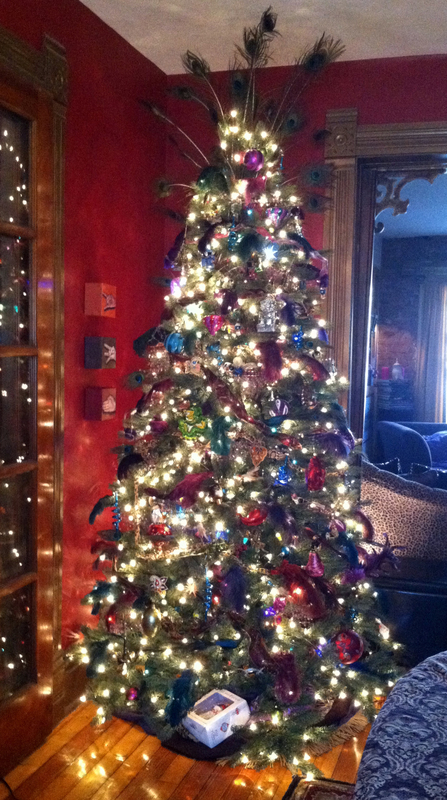 My tree theme is Indian/Asian in jewel tones. Over the past 4 years we’ve been collecting lovely themed ornaments such as peacocks, elephants, dragons, and even a couple sweet little Buddhas. To fill in I’ve added lots of pretty wired ribbons (a great (and cheap!) alternative to garland. 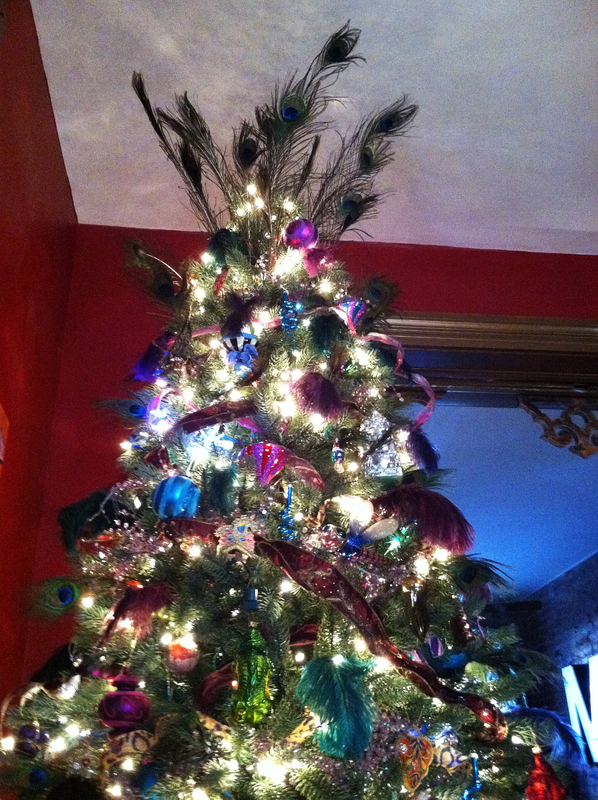 ), lots of more simple ornaments in jewel tones, some vintage and antique ornaments, and my favorite, feathers. There are scores of peacock and dyed ostrich feathers (purchased years ago on Ebay, and still going strong! A big visual impact for very little cash.) on our tree, making it rather unusual and really striking. I love unusual themes and color schemes. Try something weird! Go modern with black and white. Elegant with a monochromatic scheme, or get crazy with toys and primary colors. Sky’s the limit! I’ll share some other really fun trees I found at the end of this post. She says: “Lights should be added to your tree before other decorations. 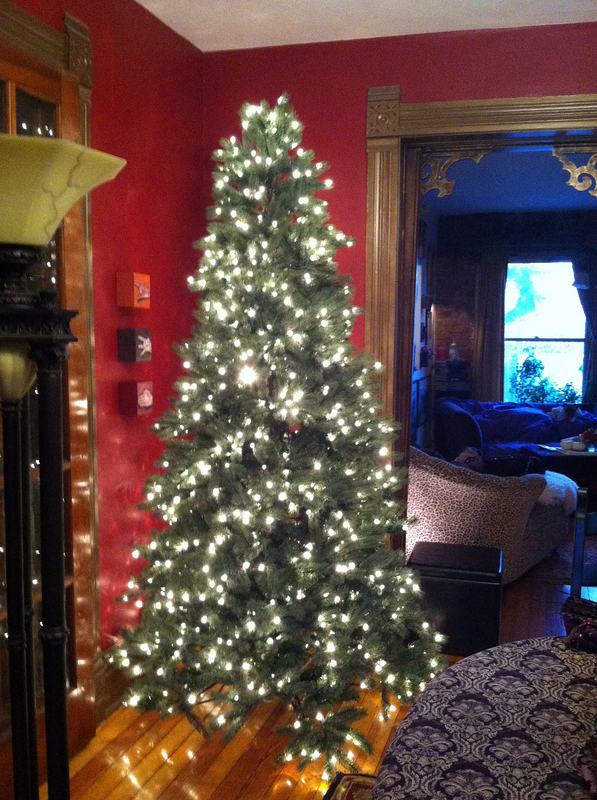 Our technique will play up the depth of the tree better than draping lights only around the perimeter, while also concealing the wires. 1. 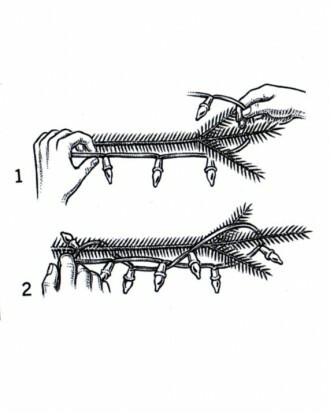 Starting at a bottom bough, string lights along the underside of each branch. When you get near the end, loop lights around the top of the branch. That’s as good an explanation as I could give (see her whole article HERE) This method of adding lights gets in deep and lights the whole tree inside and out, and hides the wires perfectly. Next I added the ribbons (or garlands if you have that), watching for a balanced look up and down and side to side. Then comes the fun part, the ornaments! A few notes on ornaments: In general try to keep the large ones on the bottom and the small ones towards the top. If you have children or pets, hang the fragile ones out of reach of small hands and paws, and be sure and secure them in place. 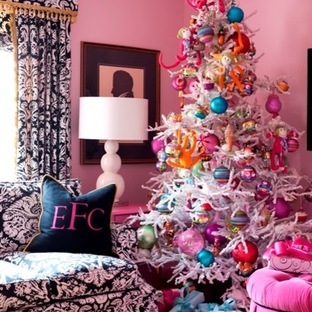 Start with the “foundation” ornaments, ie: the solid, more simple ones, saving the special ones for last, and be sure and hang them inside the tree as well, not just on the outside, to create visual depth (ie: Layers). And don’t ignore the back of the tree, even if it is against the wall. You’ll still be able to see through the tree with the lights on. 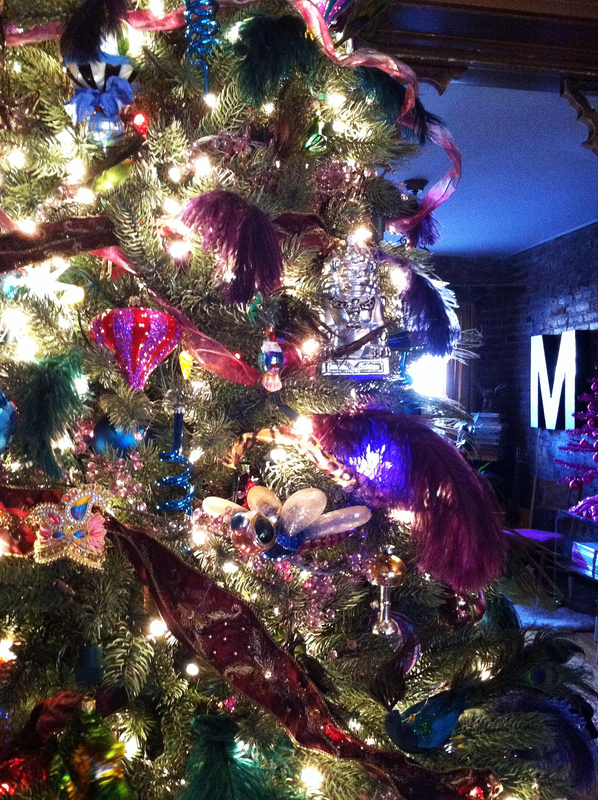 I usually hang older, damaged, not-so-perfectly-on-theme ornaments in the back just to provide some color. Stand back every so often and check your tree for visual balance. 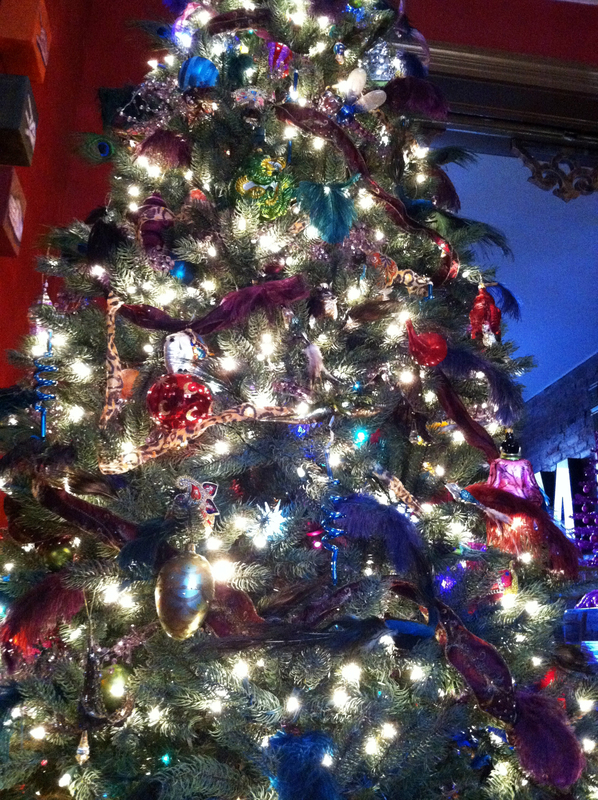 (Most of us tend to “clump” our ornaments. Not pretty.) When you are done hanging the ornaments, stand back and really give it the once over. Does it need anything else? A bit of bling? Are there any holes? 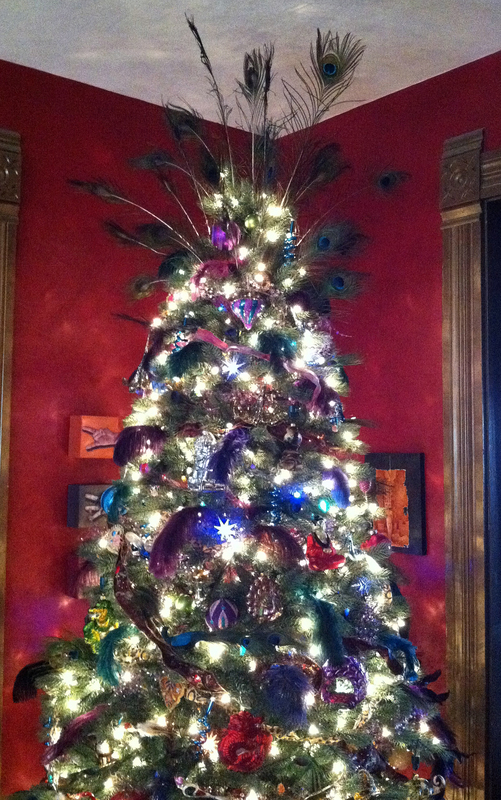 For the final details on my tree I add the ornament spinners*, and then the feathers. I start by looking at the tree and filling in the visual holes, being sure to check for balance often. 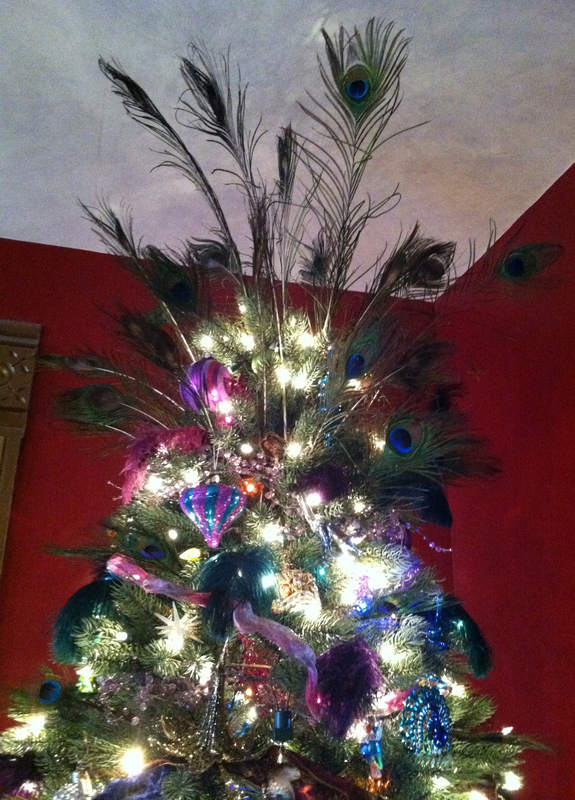 For the top, a spray of peacock feathers complements the theme. They are simply tucked in. 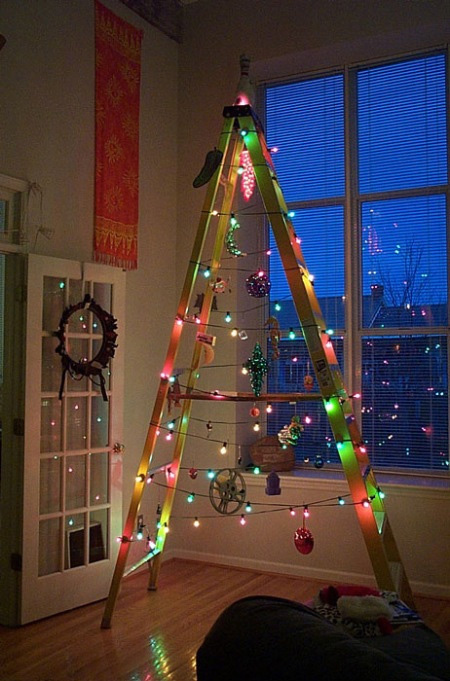 There are loads of fun, inexpensive things you can add to your tree. Feather boas instead of garland, natural elements like branches and pine cones, plain or painted your theme colors, origami, silk flowers, ribbons…get creative! 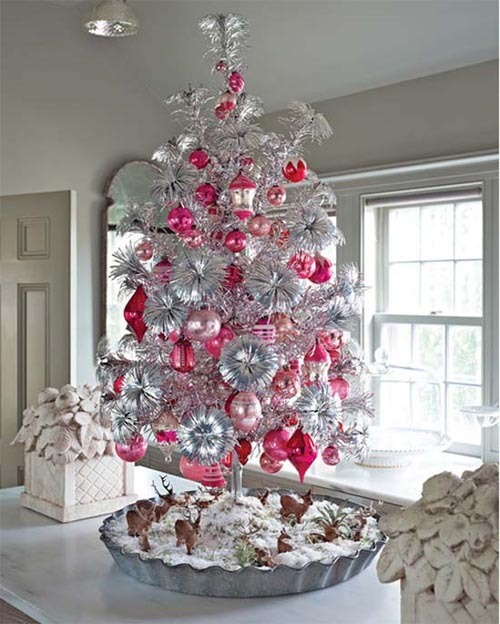 I once saw a tree all done up in vintage rhinestone necklaces for garland, and another that was all stuffed animals! The possibilities are endless. 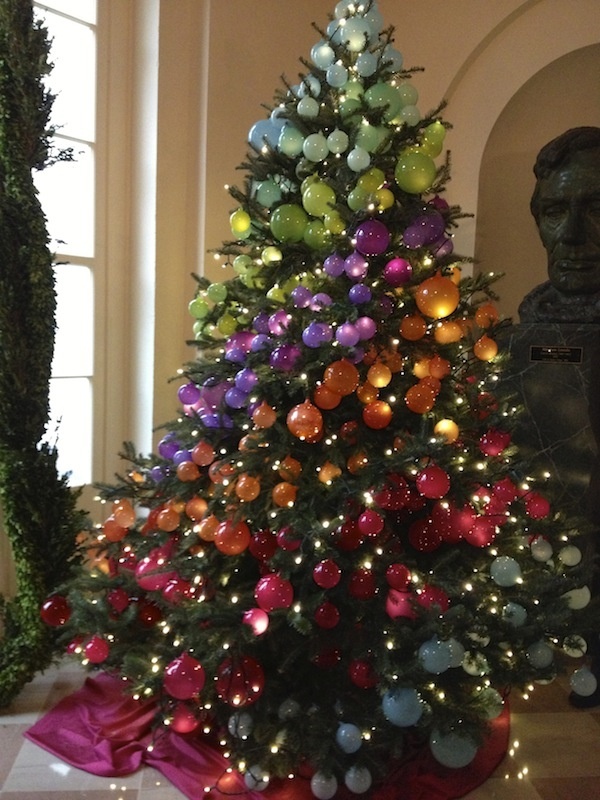 This gorgeous ombre tree was in the White House. 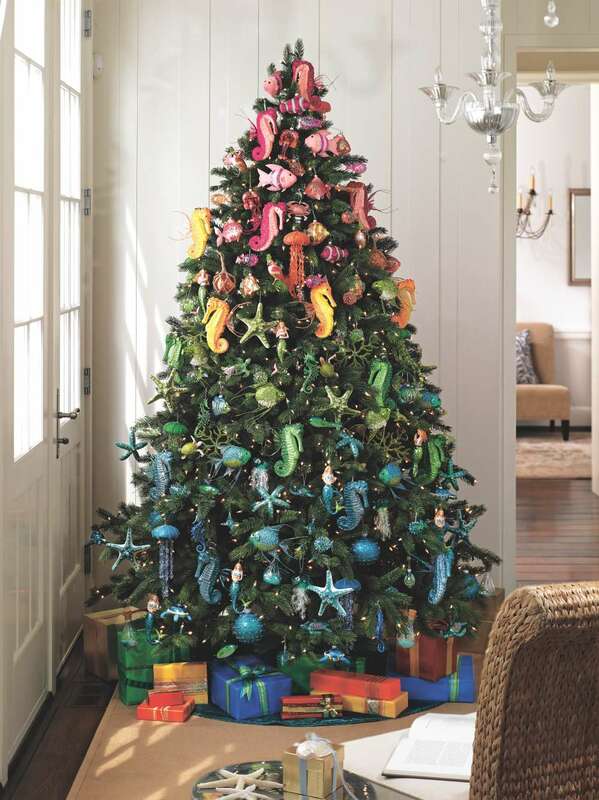 This lovely beach-themed tree is courtesy of kohls.com.